Are you one of those people that can't start his or her morning till you've had a cup of coffee. I try not to be, but every now and then the caffine urge gets the better of me. I prefer to wait till everyone else has left the house, for a time when I can drink/sip/slurp in peace. 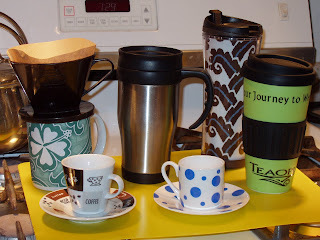 I have found that coffee has slowly been over taking my kitchen. I would imagine that my coffee making supplies should only occupy one small piece of counter top and a can's worth of space in the cupboard. Yeah right. At present there are two coffee machines on the counter. 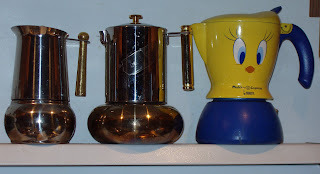 The first is a Tassimo that makes individual cups. Each morning I make myself a cappuccino. That's my treat or possibly bribe to get myself moving. I tend to wait till I have to time to sit quietly and sip at leisure. I dug the espresso machine out for my niece to use, she worked in a coffee bar for years, but she doesn't really drink much of the brew, so it sits mostly unused. On the weekends I usually make up a full pot and pour out 5 cappuccinos as a treat for the family. At times I feel the urge to be a purist and I make espresso using the Italian method. What good is coffee without drinking vessels. We have an assortment of cups from traditional espresso size up to large travel mugs. With five people in the house, that's a lot of cups. At the upper left show the manual filter cone that gets frequent use as well, specially by son. It's sitting on a wonderful coffee mug that I received as a gift from Hawaii. Along with all these basic items, there are all the coffee extras. The actual coffee including: caf coffee, decaf coffee, caf espresso, decaf espresso, a variety of flavoured coffees and then there are the many coffee pods that are used in the Tassimo. 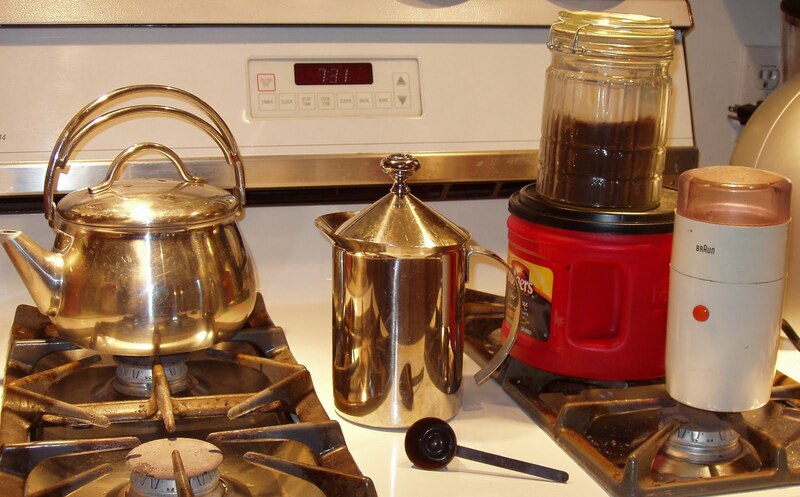 Don't forget to add in the measuring scoops, coffee grinder, milk frother, kettle, etc. After all this talking about coffee it makes me want to brew myself a fresh cup but then I'd be up all night. I guess if you send me your coffee comments I could stay up reading them and responding.... Imagine if I were to get started on tea. eeks! 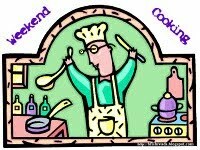 On Saturday join with "Weekend Cooking" which is hosted by Candace at Beth Fish Reads. All readers are welcome to join in this meme and link their food related post. I love coffee and it is the fuel that keeps me going! I wish I were your neighbor! We could enjoy a cup together. I love this post. I have a similar coffee maker (well two of them) as your Bialetti, but mine makes espresso only and is plain metal (no cute design). I love the look of that cappuccino machine though. It just so happens that my husband and I started looking this week for a new coffeemaker. We're trying to find something special. This was a great post to give us some ideas of going beyond the usual. OMG---so many choices! It actually looks like my house every time I buy a new coffee item ..the man says "don't you have one of those?" never enough coffee!! I love my one,occasionally two, cups of proper coffee s day. Here on hols I have a favourite cafe. But they only serve in a small cup. So I tried in my bestess Spanish to ask for a larger one as instructed by aunty "un cafe con leech double". Guess what, I got the same size cup though it did taste stronger,LOL. I love coffee, and I REALLY love your collection of coffee paraphanalia. 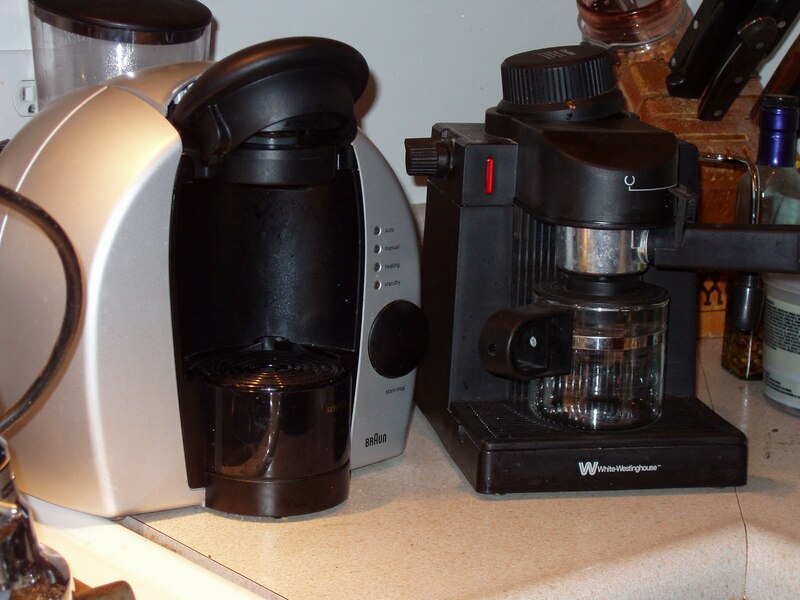 Hate coffee but would love to own the 'tweety pie' maker - was that the mukka express?